The Industrial Revolution was a time when the manufacturing of goods moved from small shops and homes to large factories. This shift brought about changes in culture as people moved from rural areas to big cities in order to work. It also introduced new technologies, new types of transportation, and a different way of life for many. Where did the Industrial Revolution begin? The Industrial Revolution began in Great Britain in the late 1700s. Many of the first innovations that enabled the Industrial Revolution began in the textile industry. Making cloth moved from homes to large factories. Britain also had plenty of coal and iron which was important to power and make machines for the factories. First Industrial Revolution – The first wave of the Industrial Revolution lasted from the late 1700s to the mid-1800s. It industrialized the manufacture of textiles and began the move of production from homes to factories. Steam power and the cotton gin played an important role in this period. Second Industrial Revolution – The next wave took place from the mid-1800s to the early 1900s. 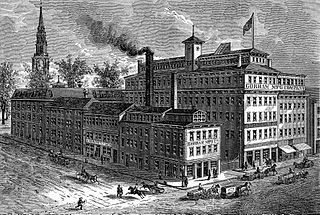 During this phase large factories and companies began to use more technologies to mass produce goods. Important innovations during this period include the use of electricity, the production line, and the Bessemer steel process.